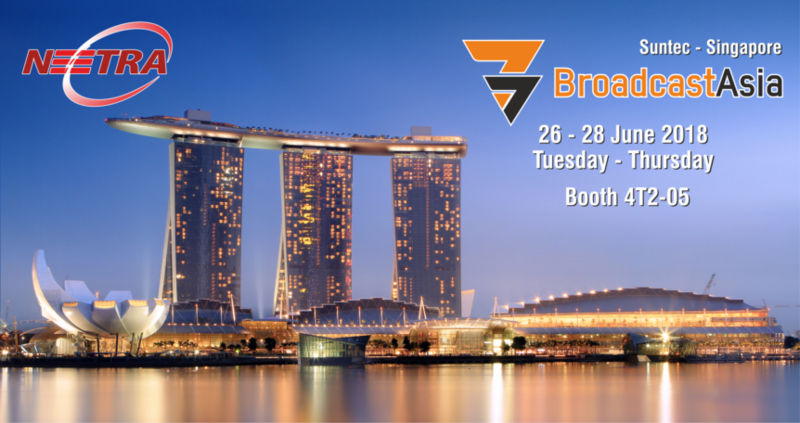 Let’s meet up at SUNTEC SINGAPORE for BROADCASTASIA 2018! BroadcastAsia International Expo, the leading trade show in Asia for digital and multimedia technologies for the professional audio, film and television industries, has reached its 23rd edition. As every year, the BCA reconfirms itself as a must-attend event for all the operators in the different segments of Broadcasting sector who want to promote cutting-edge solutions, create relationships, business opportunities as well as gather valuable information on market trends and current technological developments. CAPTURE THE FUTURE, this year’s BCA slogan, sounds like an invitation for all the professionals and enterprises to collaborate together on avant-garde projects, in order to open new paths in the Broadcast industry and stay abreast of today’s technological evolution. Neetra, as usual , will be glad to take part to the BroadcastAsia with the Australian partner N-COM. We are enthusiastic to promote our solutions, share ideas of sustainable progress and enrich ourselves with a further valuable experience . Come and visit us at BOOTH 4T2-05 at Suntec Singapore on 26-28 June!